Haha, I messed up this task a bit, and didn’t achieve the perspective we were supposed to end up with! I also ended up with more paint on my face and in my hair, than on this color “map”. “Divide an A3 paper into 5x5cm squares with a pencil and a ruler. Draw in a pencil perspective, and let the perspective lines follow the square outlines. Chose a complimentary color couple from the color circle. With the complimentary colors and its different shades (from light to dark), color in each square so that you achieve a perspective . I should have pre-mixed the colors before I started painting… But I didn’t. So the colors are a bit all over the place in certain areas. 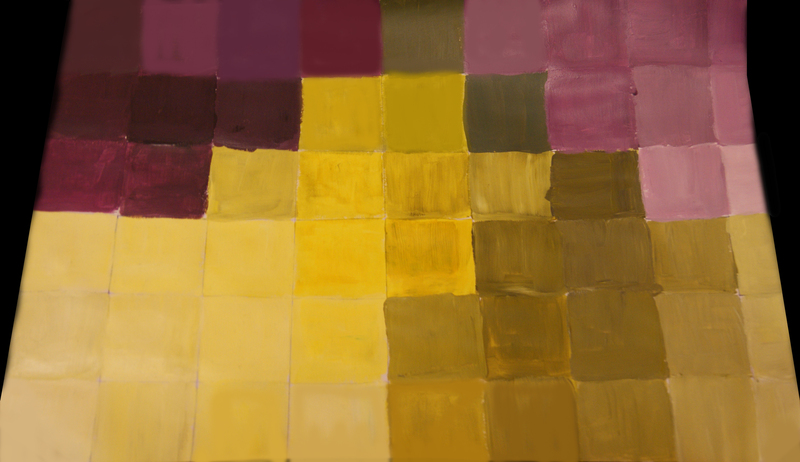 As you can see, I have chosen purple and yellow from the color circle as complimentary colors. To get purple, I mixed red and blue. Yellow is already a primary color, so didn’t have to pre-mix anything to get yellow. To get lighter and darker shades of the complimentary couple, I added white and black paint into the mix. I understand the basics, all though I know I messed up this task a bit. One more entry to go, and I’m done with this educational week.